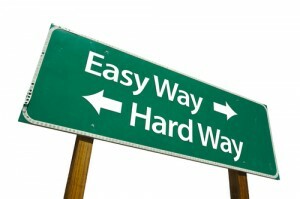 Discussed: Is the Christian life easier or more difficult? No one told me the Christian life was not a cake walk. No one was there to tell me that, while life with Christ is rich, full, and abundant, it can also be ripe with disappointment, grief, and heartache. The Christian life is not the guarantee of an easy life. Quite the opposite, in fact. Jesus even said so….Remember all the parables Jesus shared with His disciples? “Narrow is the path”, “hate your family and your own life”, “sell your possessions”, “the first shall be last”, and so on. The Christian man or woman, upon knowing Christ, is suddenly and all at once aware of their desperate need for God. The blinders are removed from our eyes. We see our sin, our depravity. We feel our shame and our conviction. While we serve a gracious and forgiving God, the realization of our real nature can be jarring, unnerving, and even depressing, for some. More than that, many believers fall wrongly into believing that they can “earn” God’s approval. If they just “try hard” enough, they can please Him. Sadly, they go through their Christian life feeling inadequate and unfulfilled. My Christian life, in so many ways, has been so rewarding and full of fruit. I daily thank God for saving me from the life I almost had. That is not to say, however, that since becoming a Christian my life has ceased being difficult and, in many ways, my life has become more difficult. My family, for instance, are not Christ-followers. I say “Christ-followers” because, if you ask them, they would say they are “Christians,” but Christ is not the centerpiece of the life. As a result, some of my family members and I have had painful, hurtful, even destructive exchanges. I confess that I am not always the innocent one. My heart is so burdened for their salvation that sometimes I am either silent before them or express anger towards them. Both are sinful. Forget me and my strained family relationships, what about missionaries going into the field? Many of them perhaps never expected, nor planned on serving Jesus in a third world country with danger as their constant companion. Is their life easier or harder since knowing Christ? I would vote more difficult, but how much sweeter are the rewards. The Christian life is not the promise of the “good life,” or even the “American life.” It is, if we are obedient to Him and Spirit-led, the promise of the “abundant life”. The Christian life demands our obedience, attention, focus, and devotion. Jesus purchased our lives and He never promised us a walk in the park. Regardless of what some big-time pastors–whose names I won’t mention (*ahem* Joel Osteen), would have you believe–the Christian life is a life spent devoted unto Christ, our Messiah. It is not about the easy way out or a life free from heartache. I would rather live the life God has handed me, with all its mountain peaks and valleys, and have Christ to walk it with me, than all the carefree living in the world without Him. What about you? How has your life changed since knowing Jesus? Is your life harder in some aspects or easier in others? Do you think people wrongly believe that the Christian life is suppose to be easy? I accepted Christ at a young age, but I already knew life was no cake-walk. For me, Christ was a lifeline. The only One to cling to in the storm that was constantly raging. He is the One that got me through those years. He is the only reason I made it through my teens, and was able to face my “issues” with any kind of hope. My sis once joked that without Him, I would have been one of those bodies they discovered in the desert somewhere. I never expected life to be better on this earth just because I accepted Christ. I just knew Christ is an infinitely better resource than anything this world has to offer to deal with this life. He is a better father than even the best of those down here. He is a better husband to those without. He is the best of friends. The most constant of companions. I’ve seen so many people roll their eyes at what I’ve just said. They are sick of the idea of Christ being those things for you…because how can someone who isn’t physically here right now fill those relational needs. He can. Once I thought it wasn’t possible. I was wrong. He is and He does. I couldn’t make it through this life without Him. I have deep sympathy for anyone that even tries. I couldn’t. I NEED Him. For me, the abundant life isn’t about cars or a home or a nice retirement account. It’s knowing that He will never leave me, no matter how boneheaded I am; and He has something much better for me when this world fades into a dream. Life is hard. Life without Christ is a life without hope, and to me…that’s not just harder…it’s impossible. I couldn’t do it. He’s keeps me going. “He is a better father than even the best of those down here. He is a better husband to those without. He is the best of friends. The most constant of companions.” This pretty much sums it up for me. I feel the same way. Where my life is more difficult for knowing Christ far outweighs the blackness that my life would have been had I never found Him. I’ll take low lows with Christ over the highest highs without Him.You are so right, life without Him offers no hope…and that sort of life is impossible. Thanks for sharing Dee Dee. The best illustration I ever heard on this topic utilizes a pair of chopsticks that form a “V” rotated with the closed end to your left and the open end to your right. The way of the world is to live right-to-left. As you enter, you make the easy choices to have fun and do things your own way. But as you proceed on this path, life gets harder as the consequences of those choices become more and more oppressive, eventually leading to death. The way of Christ is left-to-right. We start at the point of death. We die to self, to our own rights of self-determination, to the sinful choices that our peers are making (which deceptively appear fun and fulfilling), in order to obey Christ, joining with Him in His death. As we continue moving from left to right, life does get easier as we do not suffer the natural consequences of sinful choices. We are truly blessed as life goes on and we are surrounded by brothers and sisters who love one another and serve each other, in the comfort of relationship with the living God. This is abundant life! just “try hard” enough, they can please Him. The Bible does tell us that we are “approved” by our actions: persevering in faith through trials (Jam 1:12) and by accurately handling the Word of Truth (2 Tim 2:15; 1 Cor 11:18-19), and that it is important for us to walk in rightousness and to do the things which are “pleasing” to the Lord (Mal 3:3-4; Jn 8:29; 2 Cor 5:9; Eph 5:6-10; 1 Thes 2:4; Heb 11:5; 1 Jn 3:22). It is possible for His children to do things which are unapproved and displeasing in His sight. But we cannot do anything to earn His love. His perfect love extends to all, even those who still practice sin (Rom 5:8), even though they do not receive His approval and are not pleasing to Him. I love that illustration. So great. Thanks for sharing it. To your other points. Perhaps it is just semantics but being approved by our actions is not, in my mind, the same as “earning” approval. I used the word “earn” to signify “striving” for God’s approval. The 2 Timothy 2:15 passage for example says “Do your best to present yourself to God as one approved, a worker who has no need to be ashamed, rightly handling the word of truth.” My understanding of the verse is “approved after being tested” and shown to be able to handle God’s Word effectively. We do not earn His approval but we do things of which He approves. I also did not bring into question God’s love, even for those who practice sin. Please tell me if that is, in your understanding, a wrong assessment. A lot of it depends on context, but I think it’s actually harder overall. I trust in something that I ultimately cannot experience with physical senses. Therefore, there are plenty of conflicts between what my mind tells me and what my faith tells me. It is ultimately faith that wins, perhaps because for no other reason, I believe in eternity and I fear the consequences. While my heart tells me that God is real and God is good, logically, I am trusting internalized feelings that I can not prove exist. Therefore, it is highly possible that I am holding myself to a higher standard and denying myself of certain aspects of life in complete vanity. History is rife with delusional people. If God truly is a delusion however, then let me have it, because He has been the only source of life, hope, and will for much of my adulthood. Joey so much of what you describe makes me think of the struggle between the flesh and the Spirit. Also the struggle of reconciling what we know to be true as well with what we can actually see, touch, taste, etc. I think your comment though really touches on our personal experience with God, that which we, individually, know to be true about our Savior. On my really bad days, I don’t care about “Evidence that Demands a Verdict” or do I want to discuss some lofty theological point…on my bad days, I care that Christ knows me personally, and loves me infinitely, despite myself. Yeah, maybe I can’t prove it, but like you said “my heart tells me that God is real and God is good”. Previous Previous post: Is it Okay to Have Rules in Marriage?